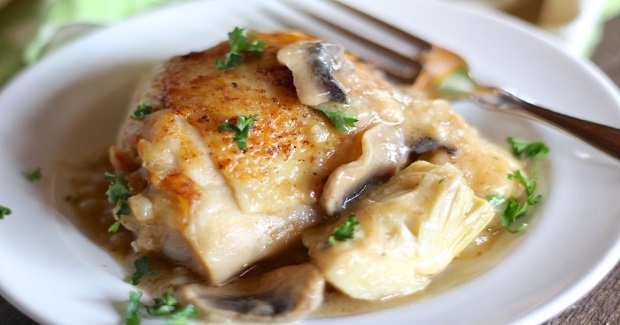 Chicken Artichoke Mushroom Skillet Recipe - Gutom Na! Posted on Monday, September 19th, 2016 at 11:38 am. Evenly and lightly sprinkle salt, pepper, and paprika over both sides of chicken. In a large skillet or frying pan, combine the butter and oil over medium-high heat on stovetop. When melted and heated through, carefully add the chicken pieces, skin side down. Cook until skin is golden brown. Carefully turn. Cook until underside is seared. Remove chicken from skillet and transfer to a 9 x 13-inch baking dish. Cover with foil and bake in preheated oven for 30-35 minutes, until meat is cooked through. Meanwhile, sprinkle flour over remaining juices in pan on stovetop. Gradually whisk in chicken broth over medium heat, making sure there are no lumps. Gradually add the Sherry, continuing to whisk until fully incorporated. Stir in the garlic and rosemary. Add sliced mushrooms to the sauce. Allow to simmer until mushrooms are tender. Stir in artichoke hearts and continue to simmer until heated through. Add additional salt and pepper to sauce, if desired. When chicken is done, remove from oven. Using a slotted spoon to drain off excess fat, transfer thighs back to skillet. Sprinkle with chopped parsley. Serve immediately or keep warm in oven until ready to serve.